Oh, leggings. Perhaps no trend has inspired as much controversy of late as these stretchy, comfy, versatile and increasingly stylish pants which, Meagan and Shana agree, ARE DEFINITELY PANTS. 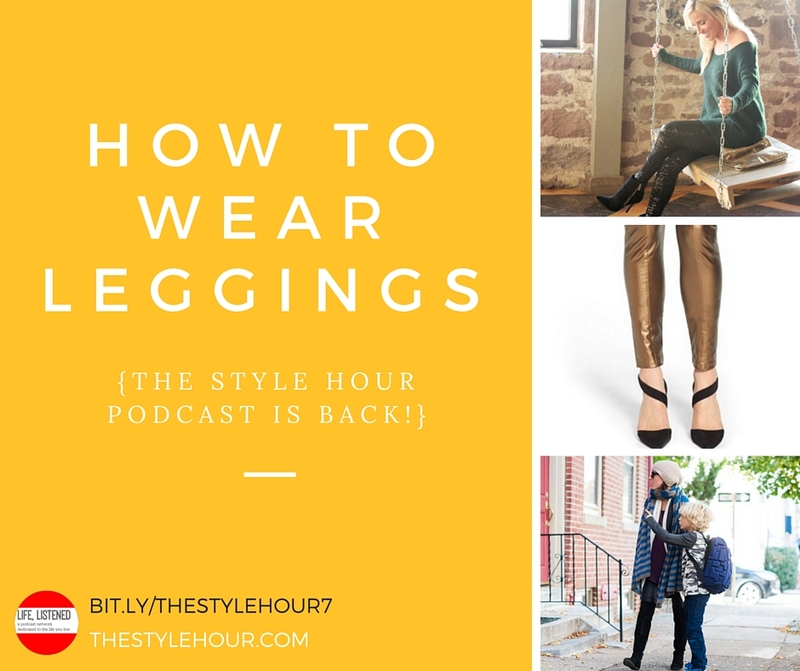 In episode 7 of The Style Hour, Shana and Meagan discuss those ever-evolving legging – what’s new, what’s hot now, how to wear them and what to pair them with – plus, Shana’s sister Scotti, a makeup artist and contributor at The Mom Edit, discusses makeup basics from foundation to primer to BB/CC cream to concealer and more. Listen now or scroll down for links and a video tutorial from Scotti! Meagan’s a big fan of Fabletics leggings (and wears them pretty much all day, every day.) Her current favorite: Clover leggings with lace inserts. Check out Scotti’s video on how to create instant cheekbones with contouring! I’m all about the leggings! I’m 30 with 4 kids, but I look like a college student. If I’m out I don’t want to look so young, I think the best way to wear them for me is to try to look like more polished, wearing more trendy styles with other more classic pieces. Or wearing leggings with a bit more mature texture/patterns (not like galaxy, or donuts, or what have you) or tuxedo style or paneled, I definitely have to try the black faux leather. Bottom coverage with leggings is totally a personal preference, I vote longer for tops that have at least some coverage of the bum and crotch. Welcome back! Missed you so much- I was so excited to see a new podcast, I listened to it during my run! I’m not sold on leggings as pants, but I think you converted me… Love the faux leather and sequins ones. Thanks ladies! Welcome back, you two! Love it! Thank you for returning! I’ve missed you! I didn’t realize it before you disappeared but I need The Style Hour to bring me some normal fashion advice. Everyone else I follow talks about kids, organizing or tech which means I’m a bit lost in the world of fashion. I’ve learned so much from this show. (And I really liked the make up advice as well!) Welcome back!!! Welcome back. Keep them coming Ladies! So glad you’re back!! I just checked out Fabletics and leggings in tall sizes!! This has made my day! below are some other items you might desire to check out when purchasing a gaming laptop. The Xtreme SL8 apart Rock remote island an try of the perfect gaming laptop. Game laptop under 500 Lenovo laptops are additionally less glossy and flashy than Asus laptops. to afford to run around from it as opposed towards the desktop computer. Let’s consider three on the company’s best Core i7 options. Good information you’ve given in the article. A person can find similar information at a site like click here. That kind of site can be helpful for people looking to find details of the topics discussed in this article. At the lessons Naples offers to the public it is possible to have fun playing the instruments coming from a various European manufacturers. The ultimate Scrapbooking tool, computers can help in pre-designing each and every page. i – Tune’s free download of the week – If a month’s wait is simply too gruelling, then you can head to i – Tunes for free weekly single. In 1934, when Jim’s coach and manager Joe Gould offers him the opportunity to resume boxing, he becomes the symbol of wish for hopeless people in the ruined nation. Victory is achieved in the event the opponent is knocked down and unable to wake up prior to the referee counts to ten (a Knockout, or KO) or in the event the opponent is deemed too injured to remain (a Technical Knockout, or TKO). However, this style was far too traditional and conventional for Picasso.